Blend your musical talent with your passion for church involvement and leadership. Study in a program that trains you holistically in worship ministry, ingraining theology into your practice so that you will be an effective communicator of the Gospel to all you serve. Worship is a central feature of church life—it unites a body of believers in communion with God through song, prayer and scripture. We teach you to balance these varied aspects of worship in a way that is cohesive, pleasing to God and powerful in touching the hearts and minds of the worshipers. 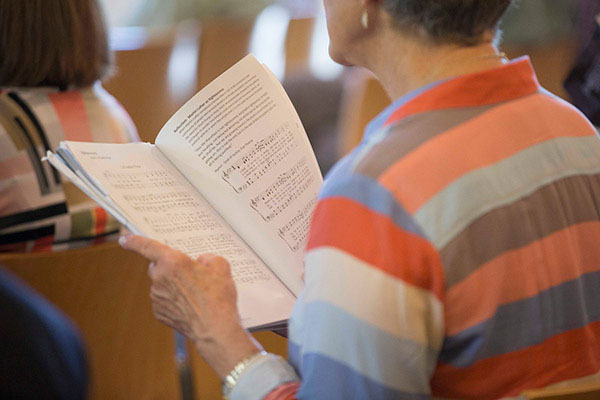 Our program focuses on biblical studies, as well as historical and theological aspects of worship, and the musical ability you’ll need to adapt songs for use in worship. You’ll leave the program prepared with the knowledge and skills to lead congregations into meaningful, purposeful times of worship. This program interweaves the College of Bible and Ministry with the Department of Music to develop an interdisciplinary experience for students. Classes are handpicked by expert faculty from each field in order to equip you for worship ministry. You will improve as a musician and hone the theological depth that allows you to function well with a team of senior ministers and other theologically trained church staff. A 3-hour internship in worship ministry is required. As a student choosing to pursue either a major or minor in music or a worship ministry major at Lipscomb University, you will be required to complete a performance audition and a music theory placement exam. A music scholarship audition may meet this audition requirement, or you may play or sing for the music faculty prior to the end of your first semester. The theory placement exam is given during the summer when you come for your ADVANCE session. The theory faculty use the exam to determine which beginning theory class (Fundamentals of Music or Music Theory I) will provide the most appropriate placement. BI 4Dn3 - Bible Text Intensive Two sections (6 hours) of this course are required, with one Old Testament text and one New Testament text. The general education language requirement must be satisfied with either GR 1515, GR 1525 or HB 1515, HB 1525. Participation in MU 1000 or MU 1010 for two semesters is required. Participation in MU 1511 for two semesters is required. Three additional hours selected from any MU or CMU courses, private lessons, or ensembles.